(SPOILERS) There’s a host of readily identifiable, familiar elements from genre fare in Leigh Whannell’s sci-fi B-movie, taking in such disparate flicks as Death Wish, Robocop, Knight Rider and Monkey Shines – and Venom, despite coming out of the gate a month earlier than the Tom Hardy starrer – and its premise, of an unstoppable, inventive AI that can see far beyond the humans who spawned it, couldn’t be called especially novel, but Upgrade comes with enough personality to be its own thing. Whannell, long-time producing partner with James Wan turned director on Insidious: Chapter Three, may not have quite the same versatility behind the camera as his long-time collaborator, but he’s certainly competent, and as a writer he’s blessed with an innate understanding of how to bring genre staples to life, clichés and all. This being low-budget (Blumhouse) fare, the futuristic trappings, which mostly singularly amount to an autocar, are a bit rough around the edges, but in the kind of likeably cheesy manner that brings to mind such straight-to-video ‘80s fare as Trancers, rather than eliciting groans at the lack of resources. As is often the case with this kind of material, one could readily imagine a big budget version with a major star, duly expanded and given the works, but it probably would have lost a lot of its personality en route. Grey: STEM, he’s got a knife. STEM: I can see that. We have a knife too. Anyway, the picture’s greatest special effect isn’t visual but aural; STEM, the AI chip inserted in the spine of quadriplegic Grey (Logan Marshall-Green, doomed to a career of looking a bit like Tom Hardy, but a genuinely good actor), and granting him the ability to walk again, and then some. Simon Maiden lends a soothing, unflappable, HAL-esque tone to STEM (Grey can hear him in his head), so making the destruction derby our protagonist embarks upon – seeking revenge for the death of wife Asha (Melanie Vallejo) – that much more palatable, even when he’s slashing an interrogation subject’s face up. And STEM’s not just great at fisticuffs; he’s a treasure at a crime scene (“I have a record of every single thing you touched”). Fisk: I didn’t ruin your life. I inducted you into my race. The Upgraded. Now you’re better than everyone else. The tension between Grey’s horror at what he’s now capable of and the release that comes with letting the AI do its thing is expertly sustained, and Whannell builds in sufficient really bad guys, particularly Benedict Hardie’s Fisk (exulting in his belief that he is part of a new and better breed, beyond humanity), that we have few immediate qualms about the course he follows. There’s also the dramatic tension of STEM being switched off and leaving Grey entirely vulnerable; as a plot motor, it’s perfect, as we’d much rather this dangerous AI was able to support him than the alternative. Less successful is the obligatory cop investigating the case (Betty Gabriel); Whannell’s unable to find a way to make her seem essential to the proceedings, so she’s reduced to a rather stale voice of conscience – a role also performed by Linda Cropper as Grey’s mum – required to pop up every so often and then be side-tracked. Although, her fate, and that of Grey, is appropriately downbeat. STEM: The fake world is a lot less painful than the real one. The potential threat of AI unleashed has never been more pertinent; what once seemed a far-off notion (The Terminator) is now an immediate concern. In his own rather glib way, Whannell posits his version of The Matrix here; all it takes is a STEM implant for every citizen, and you have everyone living in a virtual world while its hosts control the external. 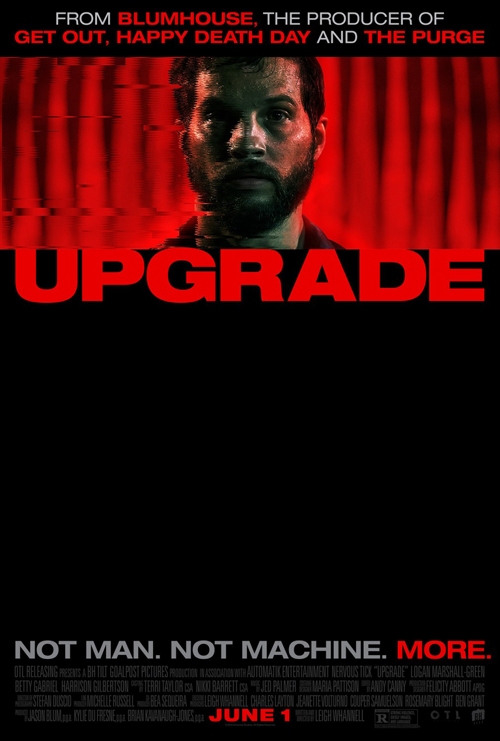 Doubtless, if Upgrade had been more successful (not that it could be deemed a failure on its budget) an Upgrade 2, in which Grey fights back, would be guaranteed; it may yet happen, ancillaries allowing, as Jason Blum has intimated plans are in the works. As it is, Whannell can be suitably proud of a funny, fast-paced, no-nonsense little genre pic.